Please note that you will need to park in the MEMEBER AREAS - as these are for ALL DAY PARKING. All other areas are with a 2 hour limit, and the council does come and check and fine people! Even though most or none of you are members, because you are there for a function, parking in the Member areas is fine by the club. The Member areas are those that you enter by using the boom gates. Sign in, the head toward to Bistro, turn left, then a quick left up a flight of stairs....this will take you to the Terrace ROom. The deadline for entering a competition was yesterday, June 1st. There was not many people who contacted us letting us know you wanted to enter. If you follow us on WPWD, there was a lot of spam, and you might have missed reading our posts. So, if you are wanting to enter a competition, you MUST let us know! To let us know, email at jeds@iprimus.com.au and let us know what you competitions you are wanting to enter. You can let us know up until Sunday, 3rd of June at 8:00pm. We will not be accepting people into competitions on the day unless you let us know. Thank-you! 3 entries per person allowed. On 1st June, voting will be open for top 10 photographs which will be displayed on the day. Voting will run for 2 weeks (til 15th June). Voting for top 10 is also open to all WPWD members. Winner will be voted on the day of Blythe Fest by everyone attending. I will load these into a private flickr group, which will be opened on June 1st for voting. At Blythe Fest 2012 we are very lucky to have such a fantastic bunch of lovely sponsors! First up is our sponsor Jane from Maidensuit! 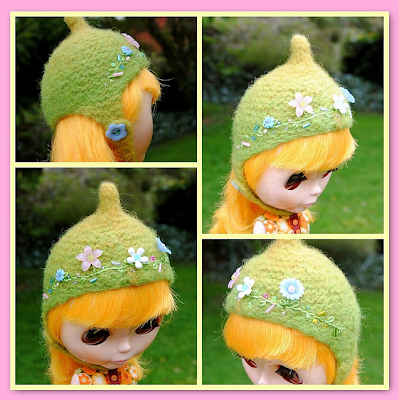 She donated this excellent blythe doll crochet beanie! Isn't it wonderful? Next, meet our sponsor Laura from Plastic Fashion! She has donated this incredible dress for the meet! Isn't it awesome?! Next up, meet Jenny from Jenny The Artist! She has donated the brilliant dress above! It's sooo cool! The above two dresses have been donated by Thea, from Prettyinthekitchen! Aren't they gorgeous?! She also has something else she is donating too a bit later on! EXCITING! The next sponsor is Nikki from Luxie Lou! 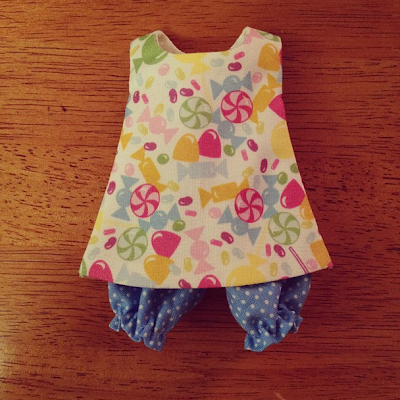 She has donated the AWESOME candy tunic and bloomers above! So so so so cute! Now let's meet Snuffy, our next sponsor! She has donated the above dress and beanie! They are just stunning! 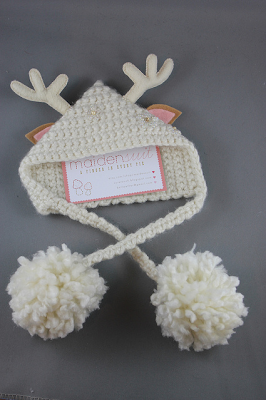 Last (but certainly not least) Ruth, from Eurotrash has donated the FANTASTIC above beanie! It's sooooooo FABULOUS! 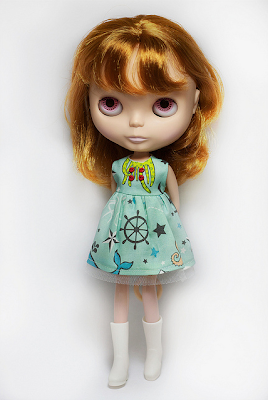 There is also a dress coming with it too and it will be revealed soon! Thank-you SO much to all of our sponsors for being SO generous to donate gifts for the Blythe Fest! We really appreciate it! 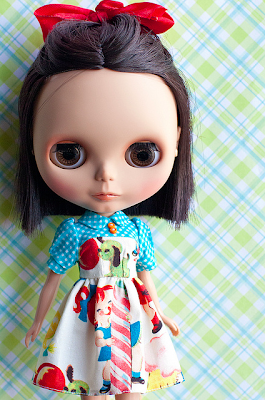 Stay tuned for MUCH MUCH more Sydney Blythe Fest goodness! 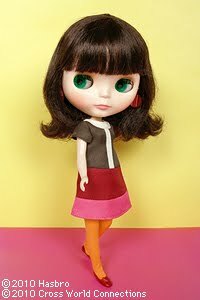 Your chance to win a Simply Chocolate Blythe Doll!!!!! Only 45 Tickets will be sold……..
Buy as many tickets as you like……….. Ticket sales are open to ALL WPWD members and people attending Blythe Fest. However if you are outside of Australia and win, you must pay your own shipping charge (approx. $40 AUD). 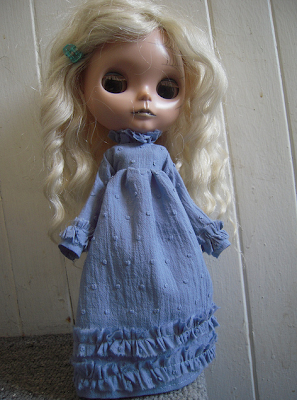 If you win and are interstate, there is a teeny tiny amount in the kitty to post your doll to you!! Raffle will be drawn on the day of the meet! Are you wanting to enter a competition at Blythe Fest 2012? Well, if you are, keep reading for some info! Competitions are for those attending Blythe Fest as they will be displayed and voted for on the day.